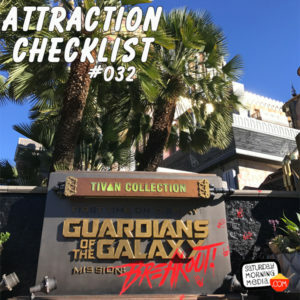 http://www.attractionchecklist.com – It’s time to experience the Marvel Universe in the Disney Parks as we explore Disney California Adventure’s Guardians of the Galaxy – Mission: Breakout! First we’ll learn a bit about the ride and then join Rocket Raccoon to help the Guardians of the Galaxy escape The Collector’s fortress. Recorded on June 27, 2017. This episode we head to Disney California Adventure to experience Guardians of the Galaxy – Mission: Breakout! The guide map describes the attraction in the following manner: Join Rocket on a thrilling mission to rescue the Guardians of the Galaxy from The Collector’s fortress! Guests must be 40” or taller in order to ride this attraction and FastPasses are available. Before we head out on our rescue mission, here are five fast facts about Guardians of the Galaxy – Mission Breakout! 1. Guardians of the Galaxy – Mission Breakout! opened on May 27, 2017. The attraction is a, somewhat controversial, rethemeing of the park’s Twilight Zone Tower of Terror which opened on May 5, 2004 and closed January 3rd, 2017. Mission Breakout uses the same ride system as the previous attraction but the queue area and storyline of the ride has been completely changed. 2. Mission: Breakout is based on the Marvel Cinematic Universe film franchise, Guardians of the Galaxy and stars the original actors from the film. Though the attraction is somewhat linked to the Marvel Cinematic Universe, the story and events of the attraction exist in their own, separate, universe called the Marvel Theme Park Universe. 3. Keeping with the original Tower of Terror, each ride on Mission: Breakout is unique thanks to computer randomization. Also, as guests experience the attraction, they will hear one of six random songs played from character Peter Quill’s walkman. The six song possibilities are “Give Up The Funk” by Parliament, “Born to be Wild” by Steppenwolf, “I Want You Back” by The Jackson 5, “Hit Me With Your Best Shot” by Pat Benatar, “Free Ride” by the Edgar Winter Group and “Burning Love” by Elvis Presley. 4. Throughout the queue area of the attraction there are several Disney Easter Eggs hidden here and there. These include: an invoice from X-S Tech the company behind the old Alien Encounter attraction, a tribute to Gonzo from The Muppets, and Dolores the octopus from the Country Bear Vacation Hoedown. There are also those who say if you look at the Collector’s collection hard enough, you may just spot Figment from Walt Disney World’s EPCOT! 5. In August 2017, it was announced that Mission: Breakout! would receive a halloween themed overlay after sunset during the halloween season at California Adventure. The new overlay is called Guardians of the Galaxy – Monsters After Dark. The ride features a brand new song called Monsters After Dark written by Tyler Bates, who’s scored the Guardians of the Galaxy films. Now let’s help Rocket Raccoon free the rest of the Guardians team! The line was extra long this day so there will be some edits in the audio so you don’t have to wait in real time. After the ride audio I’ll give you my thoughts on the attraction as you’ll be hearing my review moments after riding for the first time. Also, this is a binaural recording so if you have headphones, put them on now as we ride Guardians of the Galaxy – Mission: Breakout!.